For hundreds of years, the Jedi protected the galaxy from the pervasive influence of the dark side, standing against the atrocities perpetrated by the Sith. In the earliest days of the Galactic Empire, however, the Jedi Order was destroyed, leaving only a scant handful of Jedi, hiding across the galaxy. One of those far-flung Jedi was the great warrior and general, Obi-Wan Kenobi, and as Luke Skywalker leaves Tatooine to join the Galactic Civil War, Obi-Wan accompanies him to aid the Rebel Alliance. You can take Obi-Wan Kenobi’s prowess with a lightsaber and his knowledge of the Force into your games of Imperial Assault with the Obi-Wan Kenobi Ally Pack! Like other Ally Packs, the Obi-Wan Kenobi Ally Pack offers a beautifully sculpted plastic figure of Obi-Wan Kenobi, along with all the Deployment cards, Command cards, Mission cards, and Item cards that you need to add this Jedi Knight into your campaigns and skirmishes. Unlike other figure packs, however, the Obi-Wan Kenobi Ally Pack has no corresponding larger expansion, meaning this Ally Pack is the only way for you to bring Obi-Wan Kenobi into your games of Imperial Assault! Today, we’ll preview the Obi-Wan Kenobi Ally Pack and explore the impact he can have in your campaign and skirmish games. 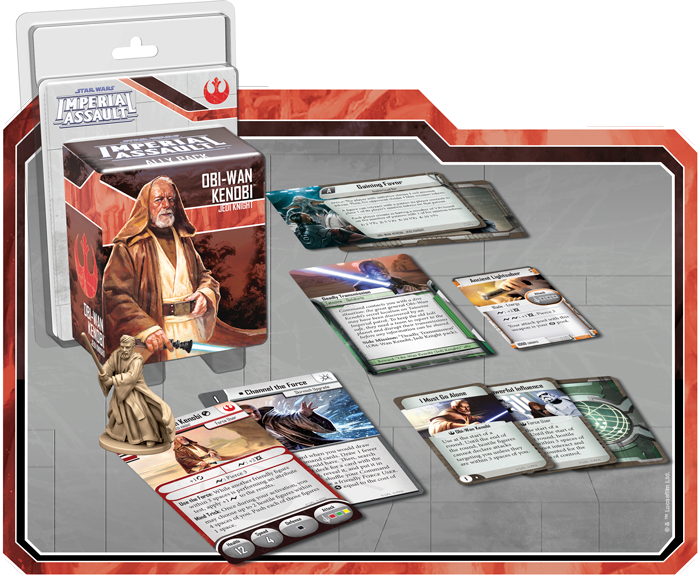 Like several previous characters throughout Imperial Assault, Obi-Wan Kenobi features different versions for campaigns and skirmishes. Regardless of your chosen format, however, you’ll soon see that Obi-Wan’s mastery of the Force makes him a dangerous opponent for servants of the dark side. In the campaign game, Obi-Wan Kenobi can be invaluable for helping you to complete your mission and keeping Imperial forces out of your way. First, Obi-Wan Kenobi is a powerful combatant, with a significant amount of health and three powerful attack dice. 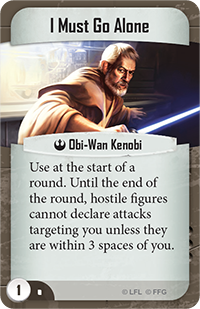 What’s more, Obi-Wan automatically receives an evade result every time he defends, and he can spend surges to increase his damage and pierce enemy armor. Even as he fights alongside you, Obi-Wan Kenobi can influence the Force to aid the Rebel heroes. 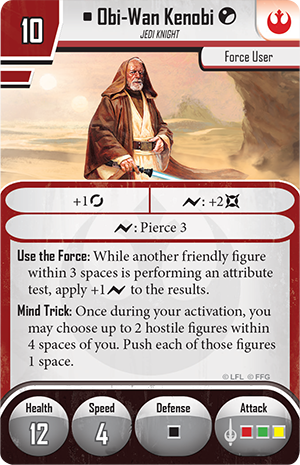 Use the Force is a passive ability that automatically adds a surge to your results whenever you’re performing an attribute test close to Obi-Wan—essentially allowing you to instantly pass all but the most difficult test. You can also use Mind Trick once during your activation to choose two hostile figures within four spaces and push those figures one space, potentially denying them a precise shot or shoving them into your line of fire. Best of all, neither of these abilities require you to spend actions to trigger them, meaning you can reliably benefit from both abilities every single round! 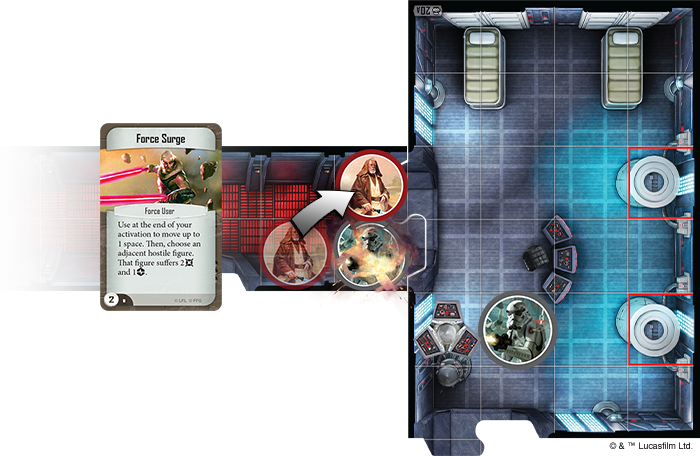 Your missions in an Imperial Assault campaign will lead you across the Star Wars galaxy, to dozens of strange locales and dangerous situations. With the new side mission included in this Ally Pack, you may travel to Tatooine to help conceal Obi-Wan Kenobi from an unexpected Imperial patrol. Despite the dangers, there are still some rewards to be found as well. Your adventures may lead you to find the Ancient Lightsaber, an undeniably powerful weapon. With attack dice equal to your hero’s insight and the ability to cut through even the thickest armor, the Ancient Lightsaber is a worthwhile weapon for any hero to claim. With the skirmish version of Obi-Wan Kenobi, you’ll find a variety of differences, but perhaps the most important is that he cost three less points than his campaign version. 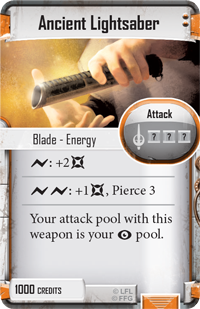 For only seven points, Obi-Wan Kenobi’s health, attack dice, and surge abilities are extremely effective, giving you substantial hitting power without expending too much of your army list. Beyond just his raw stats, Obi-Wan Kenobi also features some unique abilities in his skirmish incarnation. With Alter Mind, you prevent nearby hostile figures with a cost of six or less from interacting or controlling anything in the mission—giving you a great way to gain control of terminals or keep your opponent from completing objectives. By positioning Obi-Wan in just the right spot, you could significantly slow down your opponent’s game plan. Then, when Obi-Wan Kenobi is defeated, Into the Force allows you to choose one of your other figures and cause that figure to become Focused! Even when he’s defeated, Obi-Wan Kenobi still helps the Rebel Alliance escape and accomplish their ultimate goals. At its most basic, Channel the Force allows you to keep your Force User Command cards available on call, instead of simply hoping you draw the card you need. Granted, one of your figures must suffer strain to pay for this ability, but that’s a small price to pay to have your most powerful Command cards available whenever you need them. 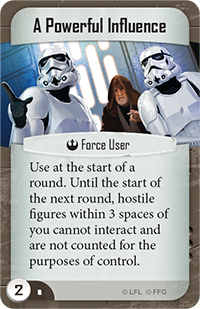 You’ll also find several new options for Command cards with the Force User trait included in this same Ally Pack, starting with Force Surge. 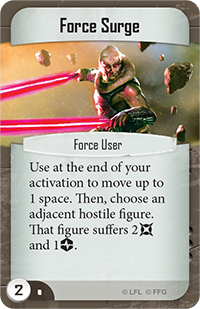 You can play this card at the end of your activation to allow a Force User to move one space. Then, you can choose an adjacent hostile figure that must suffer damage and strain without rolling defense dice! By allowing you to reposition and potentially defeat another figure at the end of your activation, every Force User becomes even more dangerous than before. With Force Surge, Obi-Wan Kenobi is able to move one space and destroy a weakened Stormtrooper, all while preventing the other Stormtrooper from controlling the nearby terminal! If you’re playing as the Rebel Alliance, your Force Users can take advantage of A Powerful Influence. Played at the start of a round, this card prevents all nearby hostile figures from interacting or controlling anything until the beginning of the next round, helping you stall your opponent and gain control of the mission. Finally, you gain Obi-Wan Kenobi’s personal Command card, I Must Go Alone. If Obi-Wan Kenobi is infiltrating deep into Imperial territory, you can play I Must Go Alone to prevent hostile figures from attacking you unless they’re at close range. 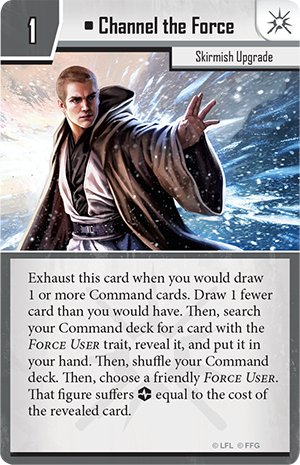 Whether you need Obi-Wan Kenobi to escape with an objective or slip past an enemy team, this Command card allows you to harness the Force and elude your enemies. The Jedi Knights have been scattered and hidden, but there is still great power in the Jedi traditions and their knowledge of the Force. 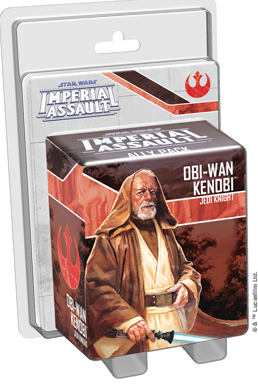 Welcome Obi-Wan Kenobi to the Rebel Alliance with the Obi-Wan Kenobi Ally Pack, and pre-order your copy of this Imperial Assault expansion at your local retailer today!